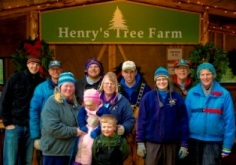 Henry’s Tree Farm has been a family-owned farm since 1947. Come join us this holiday season for a tree-cutting experience that has become a family tradition for many. Set within the 100 acre parcel is a beautiful 17 acres of Christmas trees surrounded by wooded forestland. With over a dozen tree varieties, you are sure to find the perfect tree for your holiday celebration. Located between Kingston and Poulsbo on the Kitsap Peninsula, Henry’s is also just a ferry ride from Edmonds.